The beginnings of the 200 yard bench. After giving it much thought, I decided to go with a wooden bench on a wooden platform. A concrete bench on a concrete pad would be the ultimate in rigidity, and not difficult to make. So why not make a concrete bench? For one thing, the prairie grass on my property grows 3 to 4 feet tall in the summer, so I would have to mow the grass before I could shoot over a 32" tall concrete bench. I don't like to mow! The other problem is that, from this location I can only shoot 250 yards or so max. There is another location on my property where I could safely shoot 300 - 400 yards, but that location doesn't work well for 100 or 200 yards. Perhaps someday I'll build a permanent bench at that location, but in the meantime I like the idea of a bench that can be moved from one location to another if the need arises. Also, there are tree seedlings scattered around on my property that will eventually become trees and perhaps block existing shooting lanes. Cutting the trees is not a good option after working so hard to grow them, so it may become necessary, over the years, to move my shooting bench a little bit to allow for trees. So what I decided on was a wooden platform built on railroad ties. If necessary, the whole shebang can be skidded around my property. Plus, the platform raises the bench over a foot so (hopefully) the line of fire will clear the grass without mowing. The far fenceline is 400+ yards, but for safety reasons the max range from this location will probably be 275 yards so that there will be plenty of hill behind the target to catch the bullets. Anyway, that's the plan, at least until I change my mind. I changed my mind (again ) and elected to use steel to frame the bench, because I had enough steel on hand to do the job and the steel frame leaves about 3" more knee room than a wooden bench. The top is 2" thick douglas fir. I still need to build a sturdy stool, and target frames. 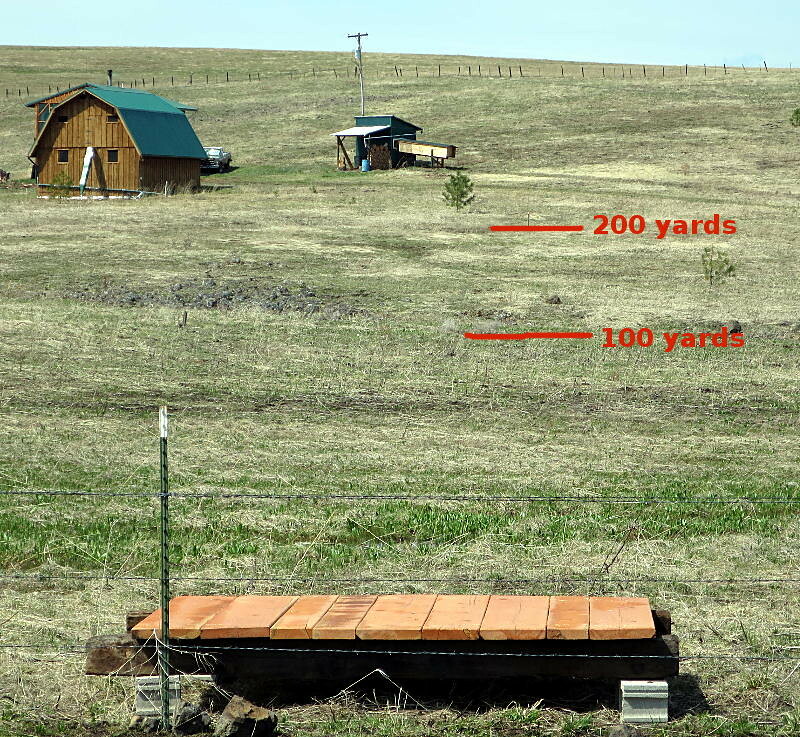 I won't know for sure until the grass grows and I walk the route with a tape measure, but it looks like I'll be able to safely shoot 400 yards if I turn a little to the left (the far fenceline is 1/4 mile). 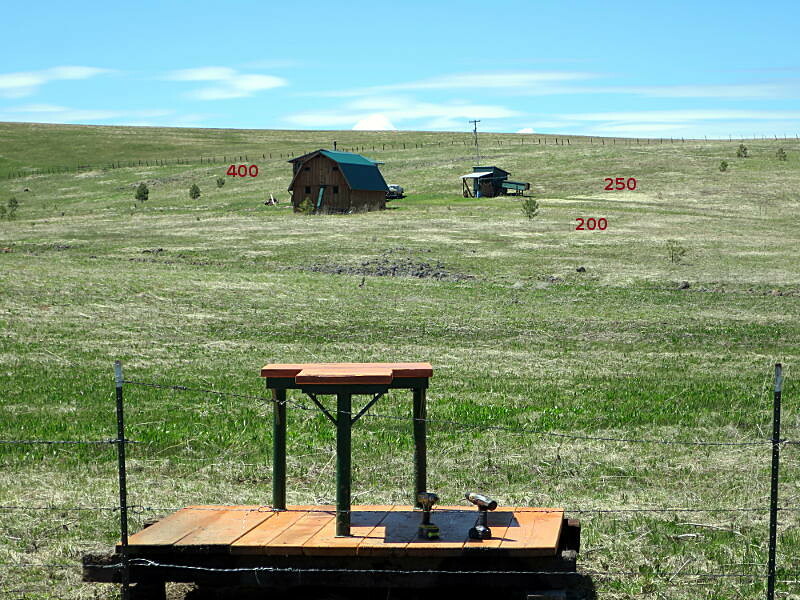 The bullet path would be closer to the house than I prefer, but it's not like I'm going to be shooting wild from a benchrest, nor will I be shooting 400 yards very often. It's been a darned busy summer and I have yet to christen the 200 yard range. But I did reinforce the floor of the shooting shack. The shack was built ultra-flimsy, tolerable for an ordinary storage shed but not so great as a platform for a benchrest. So I doubled up on the floor joists, then excavated and poured a couple of new concrete footings (while crawling on my belly underneath the shack). 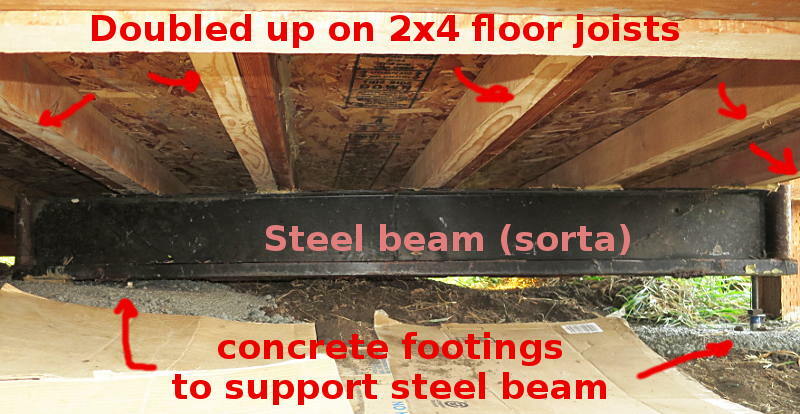 Something resembling a steel beam was found in my scrap collection and used to support the middle of the joists. The shooting bench inside the shack will never be as rigid as a concrete bench on a concrete pad, but the reinforced floor makes it sturdier than it was before.